There is a nice page showing various useful details about your inventory items performance. 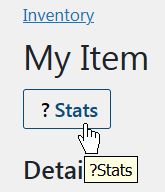 Go to Inventory, choose the item you are interested in, then click the Stats link in the menubar. You will see the quantity in stock, number of items to be received from purchases and shipped for sales, weighted average cost and price, and more. Similar to the status page, there is the inventory item history page that will show you all the movements of this item. You will see when it was added to sales or purchases, received or shipped. Go to Inventory, choose the item you are interested in, then click the History link in the menubar.